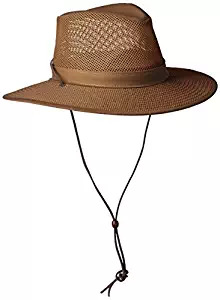 Everyone knows how important it is to protect your skin from the sun and one of the best ways to do this is with a good men’s sun protection hat. 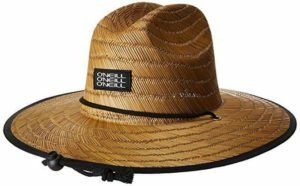 Not all hats are created equal, so it is essential to make sure you get a design with a broad enough brim and UV protection to avoid any potentially harmful skin damage. The best designs contain features like mesh panels, neck flaps, fabrics that have a UPF protection rating, and moisture wicking sweatbands. 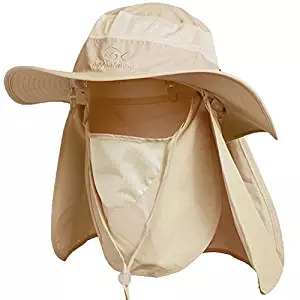 Whether you need something for hiking, traveling, boating, or just relaxing on the beach, we have found some of the best options to protect your face, neck, and ears, while also helping to keep you cool and comfortable in the warmest summer weather. A popular, inexpensive option which works well for a lot of men is the Columbia Bora Bora Booney II. It is a lightweight design with a floppy brim that keeps your head cool and well ventilated. This a good style for traveling as it packs well, it doesn’t take up much room, and it adjusts back to its regular shape easily when it is unpacked. A couple of other notable features include the ability to change the size for a better fit, the material has a UPF of 50 that should block out 98% of harmful UVA and UVB rays, and the Omni-Wick™ sweatband will stop sweat from dripping in your eyes. Also if the hat does happen to get wet, it has quick-dry properties, so it dries super fast. 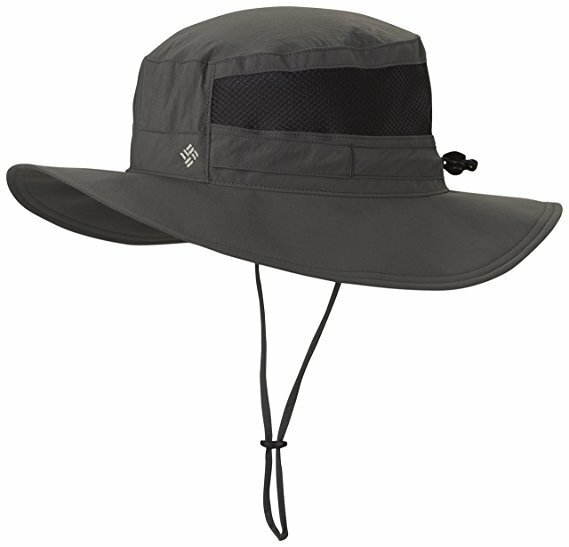 One style featuring a large mesh panel to help keep your head cold is the Dorfman Pacific DPC Outdoors Solarweave Treated Cotton Hat. The fabric mix is 75% cotton, and 25% nylon mesh, so the mesh panel takes up a significant portion of the hat. It has the standard UPF 50+ protection on the cotton, along with a Coolmax sweatband. 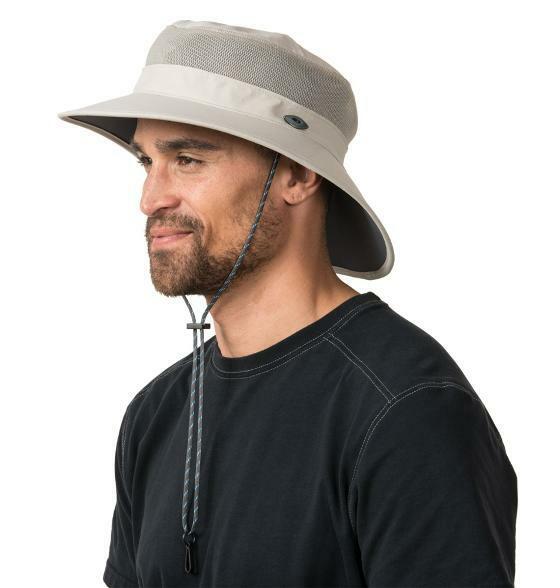 The brim is wide enough that it will protect your face and ears all day, although the mesh won’t protect any skin showing on the head, so this hat is probably best for those who have a lot of hair. 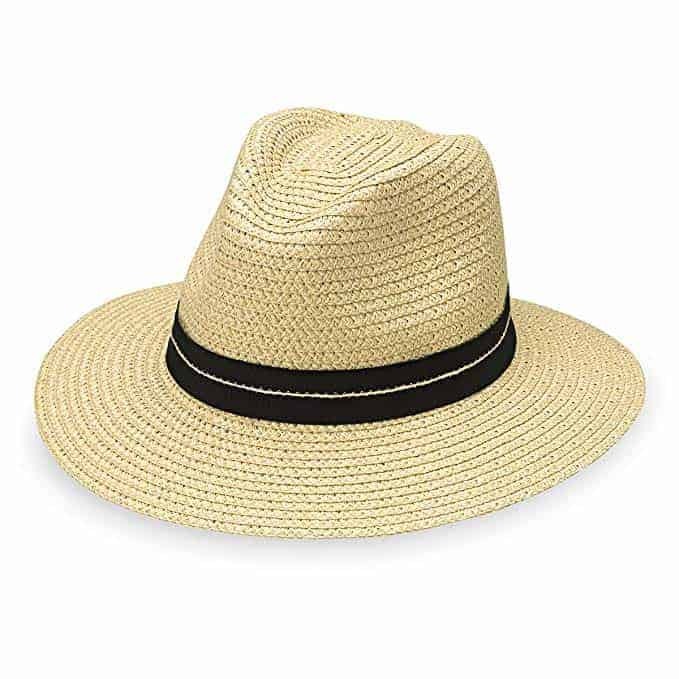 It is also an excellent option for those with larger head sizes, as it goes up to XXL which is sometimes hard to find in a sun hat. The brim is foldable, so it is easy to pack, and without getting ruined when traveling. The Outdoor Research Sombriolet is one of the most popular men’s sun styles going. It does a great job protecting the top of your head, your face, your neck, and your ears. It is durable, and the colors won’t fade in the sun. One thing that a lot of men like about this design is the light material makes it easy to hand wash and dry quickly without shrinking. As far as comfort, the crown has proper ventilation along with the UV protection, and the fit is adjustable, with a drawstring hidden in the inner band. Another nice feature of the Sombriolet is a 4 ” lined brim on the lower part with a dark glare reducing fabric, and you can shape the brim however you like. A fantastic, broad-brimmed option with a loyal following is the Tilley LTM6 AIRFLO®. Tilley makes great hats for traveling and has perfected their styles. There are a lot of features to the popularity of this style including the extra mesh ventilation around the crown which does a great job keeping you fresh. The fabric is also certified UPF 50+, so you are protected from the sun. Tilley designs have other aspects the Tilley fans love like being guaranteed for life, being water-repellent, and they have a secret pocket you can store money or valuables. The brim size on the Airflo is 3 ½” at the back and 2 ½” on the side. The LTM6 AIRFLO has a moisture-wicking sweatband to help stop sweat dripping onto your face, although you will need to clean the hat regularly to prevent sweat stains and mildew issues, luckily it is super easy to hand wash and air dry. Straw hats can be a stylish, well-ventilated choice when looking for protection. The downside is they aren’t very durable, and they can be difficult to pack if you are traveling. If you are looking for a straw design a good one to check out is the O’Neill Men’s Sonoma. 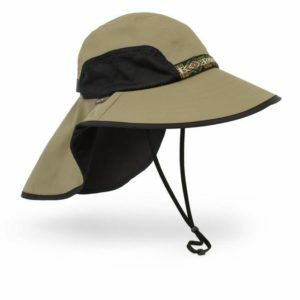 It has a 4-inch brim, which will give you excellent protection from the sun. The black lining on the bottom of the rim also helps block UV rays from penetrating the straw, as well as helping to prevent glare from the sun. 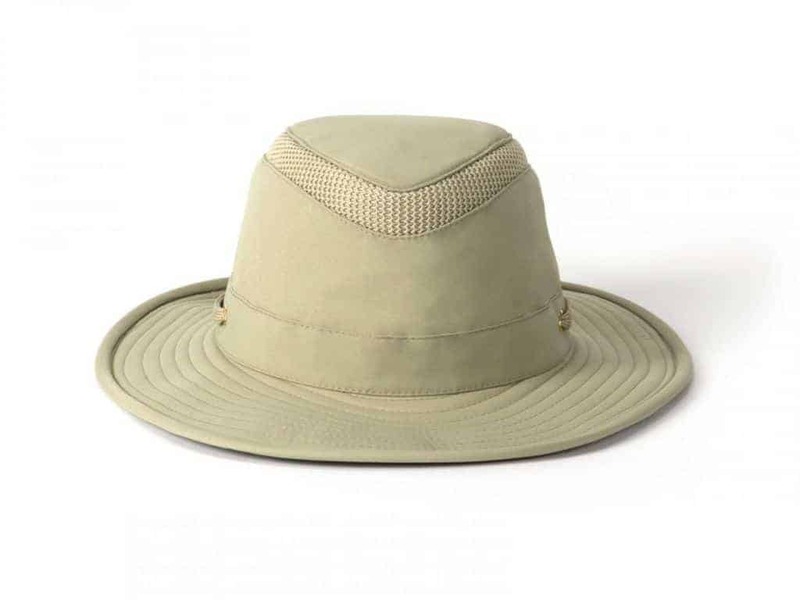 For those who might be looking for a dressier Fedora-style, a nice one to check out is The Blake from Wallaroo. This style has a 3.25″ structured brim and a wide belt around the crown to give it a little bit of a formal touch. It comes with an internal drawstring, and you can get it in two sizes so if your head is an average size you shouldn’t have any trouble getting a good fit. The material is a durable 100% poly-ribbon with a UPF 50+, so you can take it on vacation and rest assured it will protect you from the sun and it will be able to be packed without any damage or loss of shape. The only downside to this style is it doesn’t have any venting at the top, so it may hold in the heat a little bit. The fact it doesn’t have any mesh panels does mean it is a good option if you are looking for full protection so that you can avoid any burnt skin on the top of the head. 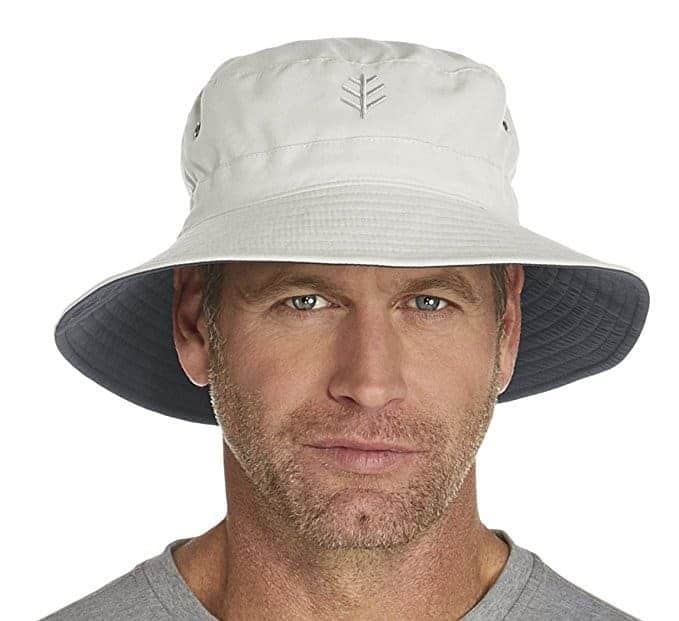 Coolibar has lots of great sun protection choices, with one of their most popular being the Coolibar UPF 50+ Men’s Reversible Bucket Hat. Sometimes bucket styles aren’t the best for full protection since the brim is traditionally fairly small. However, this hat has a 3″ brim, so it is a good design if you love the bucket style. The fabric is very soft, lightweight, quick dry, and has a UPF 50+. The Coolibar Bucket goes up to 2XL size, so it is well worth looking at if you have a larger head and have trouble finding a size to fit. The Sunday Afternoons Adventure Hat is a very popular style you will see everywhere once you start to notice it. 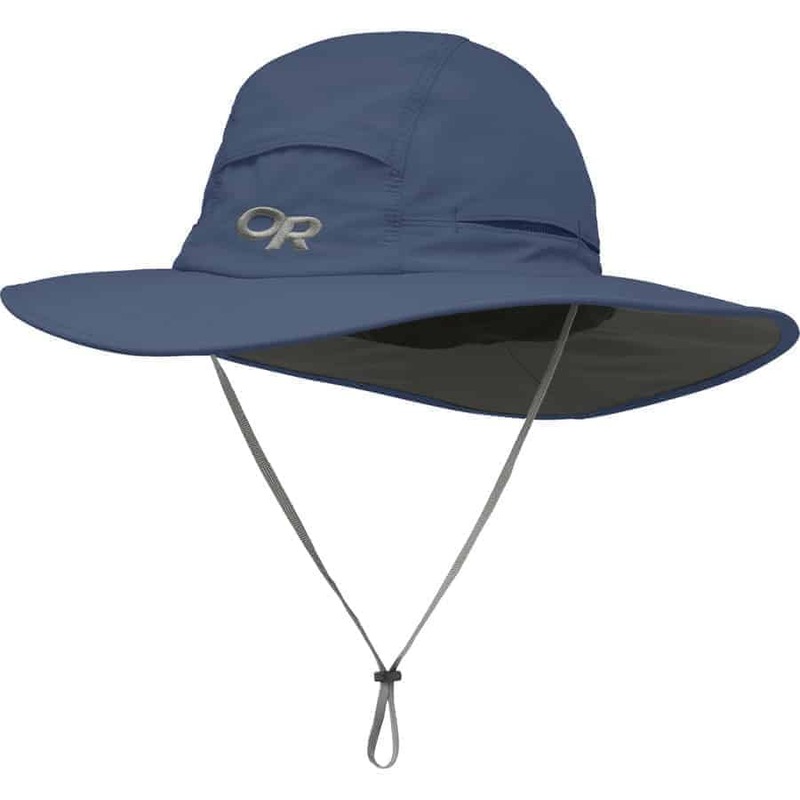 It has excellent sun protection, especially with the neck flap and the 4″ wide brim to protect your neck and head. The material is lightweight and moisture wicking, so it is cold in the hot weather. If you don’t want to wear the neck flap all the time you can lift it for added breath-ability, although it does have the mesh ventilation on the crown which may be enough to keep you fresh. It only comes in medium and large, but you can adjust the size further with the external size adjuster. The Mesh Breezer from Henschel is an exciting style that is 100% cotton mesh you can get in either a 3″ or 4 ” brim. The Breezer will give you good protection for your face, ears, and neck, although it won’t be the greatest for the top of your head due to the mesh. If you have a lot of hair, this is a good style to have a look at since it is perfect for airflow and ventilation. It can shrink a little bit if it gets wet, so you have to take a bit of extra care with this design. If you are looking for protection for high-performance sports, you aren’t going to want to wear a wide-brimmed style, but you still need to stay protected. One option is the Sunday Afternoons Eclipse Cap made for active use. The Eclipse has little cooling flaps you can keep down if you need them for sun protection or to lift if you need to get more air flow. It’s also very light, comfortable and straightforward to pack. For those who are looking for a cheap option with extreme coverage, you are going to want to have a look at this style from Ddyoutdoor. It is a little different looking, but if you are working outside in scorching conditions and you want to keep your face, neck, head, and ears protected this is a style you may want to consider. The material is made to feel cool, and it is also breathable. It is a kind of different look, but if you can get past the style, it is excellent for sun protection. The Kuhl Sun Blade is a style with a slightly different design with a lot of cooling technology put into it. It has 3D mesh, so the fabric isn’t touching your skin, and it gives a little bit more room for ventilation. It also has the all-important moisture wicking sweatband. 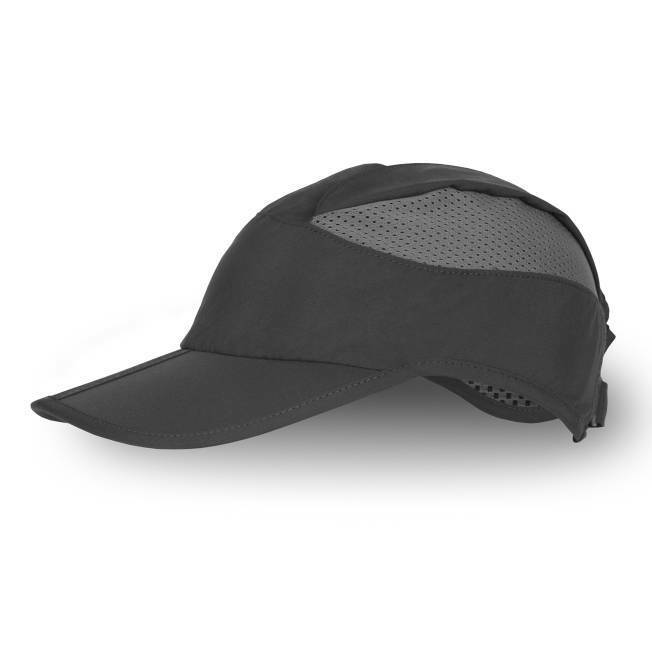 The main unique feature with the Kuhl Sun Blade is the design is wearable with either with the longer part of the brim facing forward or backward (as shown in the picture) giving you more protection where you need it most depending on the activity you are doing. The under brim also has a dark, gray fabric to stop the glare from the sun. Not all designs are created equally when you are trying to get the best protection from the sun. There are a few basic things that go into making a perfect sun hat. Breathable – A good sun design will be made of light fabric to lets the air flow through, so your head doesn’t get too hot and doesn’t trap sweat. Moisture Wicking – A lot of the best products have a moisture-wicking sweatband around the inner crown. Sweatbands are a great feature if you sweat a lot and often find sweat is dripping into your eyes. 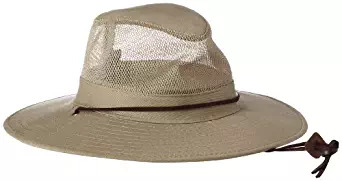 Packable – If you are planning on wearing the hat when traveling, you will want to look for a style you can fold up and pack, and that will pop back into shape when you remove it from your luggage or bag. Neck Flaps – Neck flaps look a little dorky, but they do an incredible job keeping the sun off your ears and the back of your neck, which are two areas people often forget about when trying to stay protected. Ears – Some of the neck flap options also have a little part to cover the ears as well. If you don’t love the look of a neck flap, you could look for a wide-brimmed style with a full brim around the entire head to protect your ears. Mesh Panel – Mesh panels are a great feature to have, but if you don’t have much hair covering your scalp, you may need to be careful the skin doesn’t get burnt through the mesh. The mesh will not provide the same protection as a solid fabric so if you are worried about burning the skin on the top of your head; you may want to avoid the styles featuring mesh panels altogether. Colors – It is relatively obvious, but lighter colors are a much better option if you are trying to keep cool. Cleaning – To prolong the life of the hat you will want to make sure you are cleaning it regularly, especially when exposed to a lot of sweat. Sweat can cause stains which are challenging to get rid of if you aren’t keeping on top of them. If the sweat mixes with sunscreen that can also cause issues with staining or clog the moisture wicking sweatbands that are included in a lot of styles and make them less effective. UV Protection – Look for fabrics rated with a protection rating of at least UPF 50 +.